Teufel Theatre 3 Hybrid review | What Hi-Fi? We got our first look at Teufel kit – since its relaunch in the UK – just last month, with the pleasantly surprising 2.1 home cinema in a box system, the Impaq 500. This complete home cinema speaker package gives you more box for your buck (thanks to the full complement of surround speakers) but for less money. Admittedly, this is just a speaker system rather than an all-in-one, but it's still an impressively modest price tag for what you're getting. And this is no ordinary 5.1 system. The Teufel Theatre 3 Hybrid offers a centre channel and two rear speakers alongside two floorstanding front speakers that come packing integrated active subwoofers – making a 5.2 system of sorts. 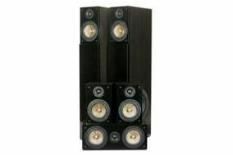 If by some rather large oversight you had managed not to notice the make-up of this system, rest assured the penny will drop when you lift up the front speakers: standing 94cms tall, the Teufel M320F floorstanders weigh in at a very hefty 18.5kg, incorporating as they do a 150 Watt amplifier to drive that 20cm sub. The rear and centre channels follow more traditional lines, and the system as a whole looks smart and nicely finished – as we've said, it's a lot of kit for the cash. Given a few days to run in, the Teufels produce a detailed, fast and cohesive sound. Watching the Blu-ray of Iron Man, special effects sound crisp and open, while the centre channel delivers clear dialogue. We're not wholly convinced by the active subwoofer arrangement: there's a distinct lack of punch and power that in turn affects dynamics, despite some impressively deep rumbling at times. Treble is a little thin and overenthusiastic, too. Don't expect miracles with music, but a blast of the Blu-ray disc of Justin Timberlake's FutureSex/LoveShow shows the package can carry a tune and have you tapping your toes. The Teufel Theatre 3 Hybrid is a substantial and stylish system with enough speed, cohesion and excitement to warrant consideration.